When you improve memory and reduce memory loss you are engaging in Neuroplasticity. This is a big word that refers to the relatively recent discovery that the brain is flexible or changeable. It was believed until recently that after a critical period of development during early childhood that the brain had fully developed. Earlier in my career as a psychologist, I was taught that if a person sustained a brain injury, there was little that would change after the first 18 to 24 months of recovery. We now know that this is not true. While it is accurate to state that the most rapid recovery occurs during the first three to six months, it is in fact possible for the brain to continue improving indefinitely. Brain rehabilitation and brain training can help in part because of brain plasticity. The ability of the brain to change as a result of one's experience or perhaps even faster with brain training is referred to a Neuroplasticity. Two major areas of the brain involved in acquisition of new information and memory include the dentate gyrus and the hippocampus. The hippocampus is located in the middle part of the temporal lobe of the brain. This structure is involved in consolidation of new memories, emotion, navigation and spatial orientation. The dentate gyrus is a part of the brain that we believe activates the hippocampus. These middle brain structures are very much involved with learning and memory. We now know that new neurons (brain cells) are produced into adulthood and therefore we now understand that the brain in plastic or can change. We also know that the brain can reorganize in other parts due to brain plasticity. This was revealed in an important study released in 2006, by Dr. Bogdan Draganski of the Department of Neurology at the University of Regensburg in Germany. Dr. Draganski and his fellow scientists discovered that plasticity of the brain occurred in a network of many memory systems in medical students studying for examinations. They found that in a relatively short period of time (months) the gray matter of the brain increased in size. 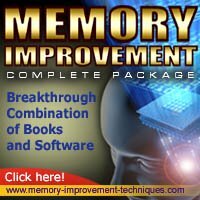 The good news is that you can improve your memory and that there is emerging evidence that brain training of various types can help.